Welcome to the 2018 High School Edition of Baseball Rules in Black and White. Our priority is to provide an educational resource that is accurate, user friendly and provides the reader superior baseball rule knowledge and retention for high school baseball. The 2018 High School Edition has been written so that every umpire, coach, player and fan can gain an improved understanding of the rules of high school baseball. The 2018 High School Edition covers the frequently called and complicated rules of high school baseball. Chapters are listed in alphabetical order in the table of contents in the front of the book, allowing the reader to quickly target a ruling. Each chapter consists of related rulings, sub-rulings and examples that are formatted logically, in order of sequence and importance. Most importantly the old convoluted rule book language in small print has been converted into accurate, easy to read and retain sentences, all in large font. 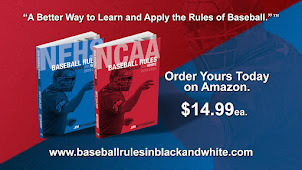 Specifically for umpires, this series of books can strengthen a solid base of accurate baseball rule knowledge, helping to improve recall and recognition and beneficially reduce hesitation. Best of all it improves your ability to articulate what the ruling actually says, when needed. As umpires we are always striving to get better. I believe the same should be applied to baseball rule books, this is why we strive to improve the format and content in every Baseball Rules in Black and White book. Learning From Failure, Creates Success!